We did it, internet! With your help, we successfully tracked down the last 12 unsold, brand-new Lexus LFAs. Here are the cars we found. Also, guess what? There are more than 12. In case you missed out, last week we learned that there were potentially 12 unsold Lexus LFAs floating around in United States dealerships. We speculated that these cars were probably being held onto for collector or investment purposes. And, of course, we had to know where they were. The possibility of buying a 2012 LFA in 2017 was too fascinating to leave be. So, we asked you for any leads that you knew of. 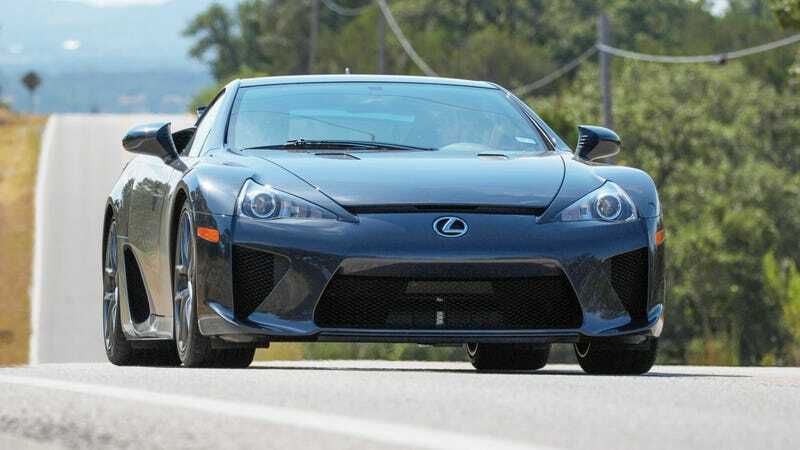 I got almost 100 emails and nearly 300 comments from readers all over the country with tales of LFA sightings. People writing in to say that they’d seen roped off, never-moved cars with low miles in Lexus dealers in Michigan, Colorado, Florida, Pennsylvania, New Jersey, Nebraska, Oklahoma, Arizona, Massachusetts, Kentucky and California. I called all nine dealerships and confirmed with each that there was an unsold, untitled LFA there. Nearly all of them were purchased by the owners of the dealerships in 2012. Their mileage ranged from 20 to almost 1,500 on the clock. They aren’t driven much, except perhaps for special occasions and by technicians to make sure they still run. Otherwise, most serve as display centerpieces for the dealerships. Many of the LFAs weren’t outright for sale (they certainly aren’t listed anywhere)—it was up to the owner’s discretion, dealers told us. Maybe if they found a “qualified buyer,” said one dealer. Another told me someone offered the owner $850,000 for the car and was turned down. But still, everything didn’t quite line up. Lexus confirmed there were 12 new LFAs, and we found 12, but multiple voices said that other dealerships had yet more cars that weren’t the inventory list. So I called a bunch of other dealers to get answers. Most of my calls went unreturned. One store confirmed that it had an unsold LFA, but then hung up and later called back to say that it could no longer confirm that the car was there. An extremely nice person at a Lexus dealership in San Francisco picked up when I called and joked that his phone had been ringing off the hook during the past few days with Jalopnik sleuths asking about an LFA. He confirmed that, yes, they had a yellow LFA that had never been registered or titled. It has approximately 950 miles on it and is for sale, although for a higher-than-normal figure. So why didn’t this yellow LFA show up on that dealer inventory list that I’d been working off of? It has to do with the warranty, as one Lexus employee, who wished to remain anonymous, explained to me. When a dealership sells a car, the dealership sends the retail delivery reports to the manufacturer so it can start the warranty and ownership time. So, even though the yellow LFA was technically never retailed or titled, the dealership started the warranty on it, which removed it from the “unsold units” list. Which means! There are actually more than 12 untitled, unsold and brand-new Lexus LFAs across the country. Exciting stuff. More than anything else, I truly enjoyed hearing from all of you guys who wrote in. It seems that there isn’t anything the internet likes more than a good treasure hunt. If you’re truly serious about buying a new LFA, this is a good place to start, but know that these dealers probably won’t take a penny below original MSRP. Hell, I was told one dealer owner wants a million bucks for his. As for the rest of us, we solved the mystery. Or at least some of it.